On Sunday 25 October the day I had waited months for finally arrived. 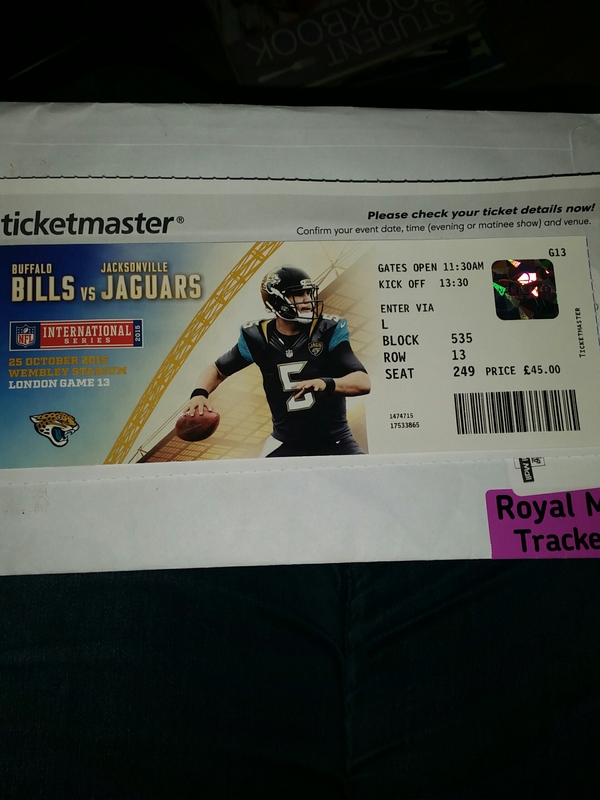 All the way back at the start of the year I bought tickets to go to Wembley to see Buffalo Bills v Jacksonville Jaguars as a combined main Christmas and birthday present for my partner. We’ve both gone to Wembley before but never for an event quite on that scale so we were interested what the views and atmosphere would be like. It also meant we had never had to sit that far up before so we wondered how good the views would actually be. I’ll be honest and say that in the days leading up to the event itself I was getting pretty nervous. People that follow me and what I say may know that I suffer with mental health issues and the idea of going outside, travelling across London and being surrounded by that many people was scaring me a little and a few of the rules didn’t help me to stay calm about it. 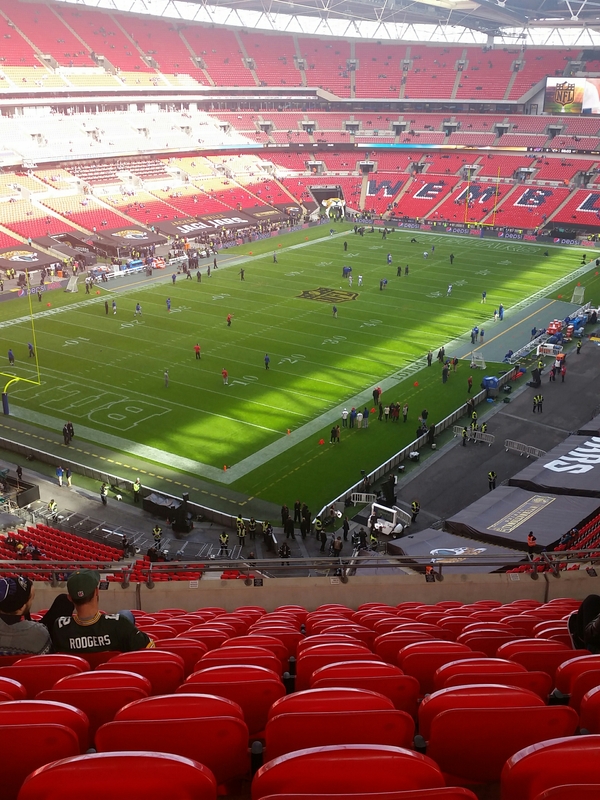 Having never gone to America or an NFL game before I was completely unaware of the strict bag rules they have in place until just a couple of days before the event when they sent out an email. I’m not the sort of person to go to fancy events or on nights out so when it said the only handbags allowed would be clutch bags I was bewildered. Apparently clear bags are also allowed but who travels through London with purse and personals on display? In the end I braved putting essentials in my pocket and clinging onto them for dear life as I went on the hour and a half journey across London and through the crowds at the stadium. After reading the silly rules that made me feel like I was about to step onto a plane rather than watch a sporting event I decided to get myself back into the spirit of it by doing my nails. We had already decided we were supporting Jaguars and therefore I went about trying to reflect that in my nails. 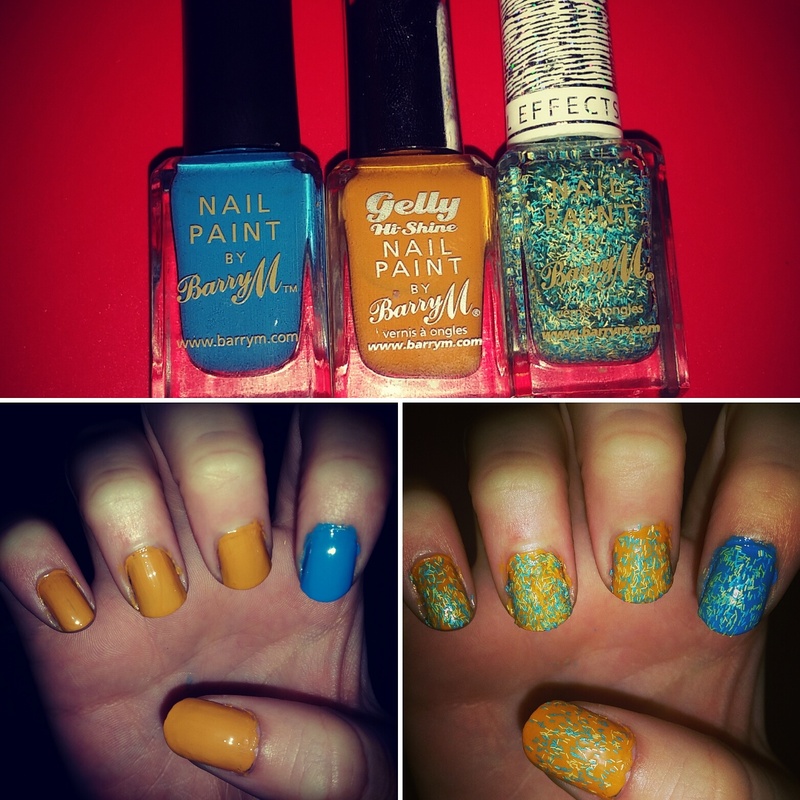 As I don’t have the nail varnish sets that you can get to show support for various teams I had to improvise a bit with various Barry M.
As always getting to Wembley proved to be no problem at all (unlike trying to get on the tube afterwards and being stuck in an hour long queue). We got food and drink from our local sainsburys before getting to the stadium and ate it outside to avoid the overpriced items that Wembley always offers. Beer drinkers: a bottle of Carling was over £5! But the rules were all so different to what we are used to as people were allowed to bring their alcohol and bottles out to their seats with them (something often stopped at a football match). Somebody was vapping away and nobody cared. It was really weird though seeing people just go away and come back with food (and I don’t just mean snacks) when they could easily have got lunch beforehand and then we were out before evening food time but I guess that is just part of NFL culture? 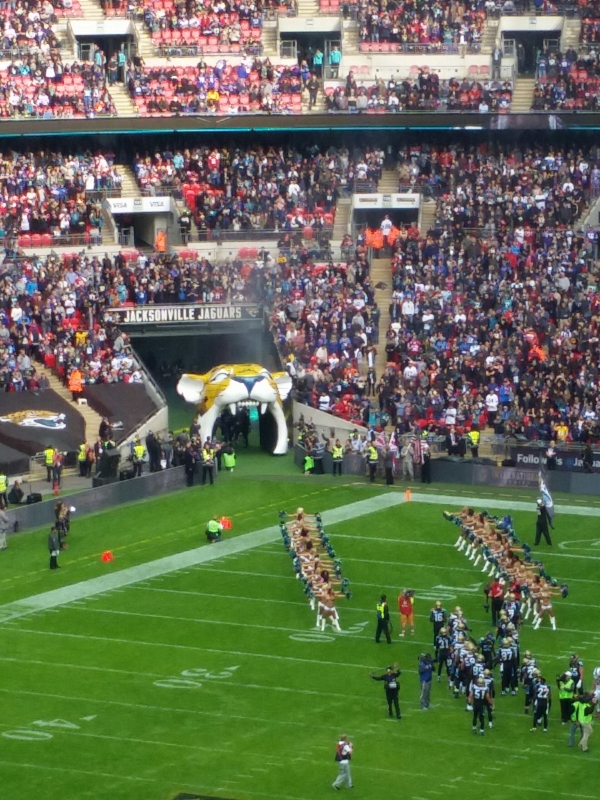 Before the game got underway the ‘Roar of the Jaguars’ cheerleaders did a performance. They were a lot more successful at being in sync than some sporting club cheerleaders I have seen but it was still pretty awkward as people got all googly eyed watching them. The better part was the Ohio State Marching Band performed a variety of songs and visual performances to really get the crowd going. Their performance alone was incredibly impressive and made me pleased I had decided to go. It’s a shame we don’t seem to have anything quite so impressive in the UK but matching that show would take quite some doing. And let us skip over the moment they thought constructing a stage to look like a rememberance poppy for the singer and others to stand on was a good idea.. In the end just over 80’000 people attended the game where the Jaguars put on a real show during certain quarters. Having only ever watched on TV before it was good to get a voiceover explaining events whilst I got used to the format. Watching the game itself was fantastic and I’m really keen to try to go again next year especially as the atmosphere in Wembley was the most incredible I have ever personally witnessed it. Such a good day out and one to remember for a very long time. 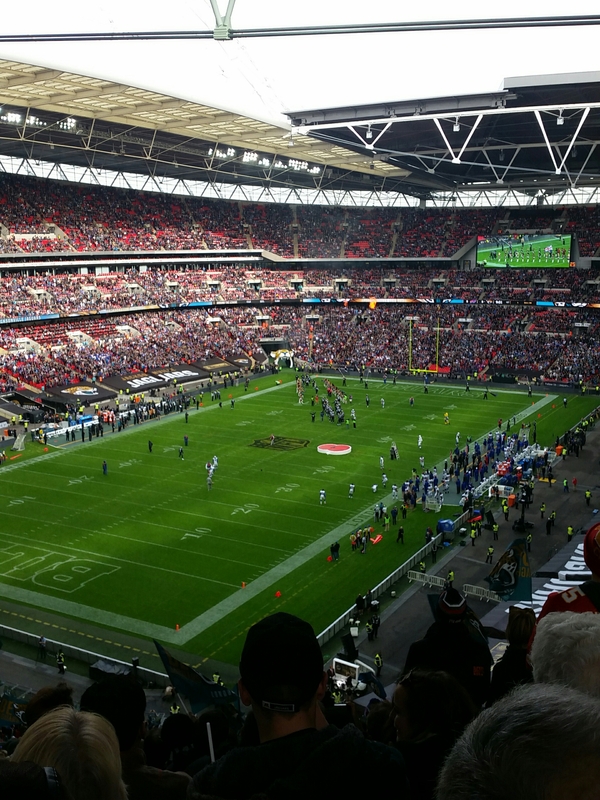 This entry was posted in Culture, Lifestyle and tagged american football, atmosphere, barry m, bblogger, bbloggers, Beauty, beauty blogger, beauty bloggers, beauty product, birthday, buffalo, christmas, crowds, Culture, day out, Drink, Food and Drink, fun, gifts, handbags, international series, jacksonville, lblogger, lbloggers, Lifestyle, lifestyle blogger, lifestyle bloggers, London, marching band, nail paint, Nail Polish, nail varnish, nails, nfl, notd, ohio, partner, rules, tickets, transport, travel, uk, usa, wembley. Bookmark the permalink.